Dalston Monsterzz is Dilraj Mann’s largest work to date. 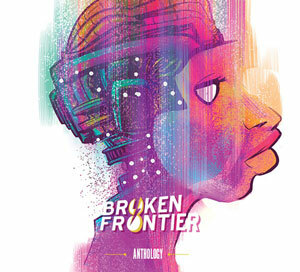 Literally, since, at 80 pages, it dwarfs the lengths of any of his minicomic of anthology work. 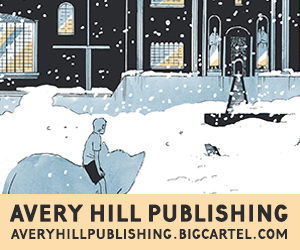 Physically, in that it follows the standard Nobrow oversized format, with its dimensions akin to a European comic album. And figuratively, in that its scope is much broader than anything he’s attempted before. 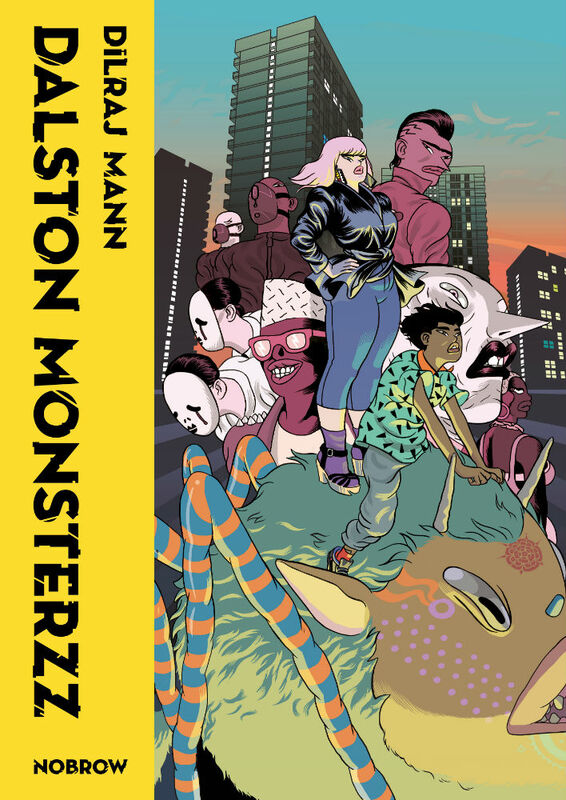 Set in East London, it concerns the confluence of meek teenager Rosh, his best mate’s new girlfriend Lolly, a swarm of colourful monsters which have mysteriously appeared in the City overnight, and a shady property developer (is there any other kind?) looking to manipulate all three parties for his own nefarious purposes. Mann’s artwork benefits from this larger canvas. His people have an ugly-cute look, their pleasingly round and curvaceous figures offset by their disconcerting gnarled faces, with cat-like eyes and wrinkled lips. They’re all the more distinctive when placed in settings drawn from life (or at least from Google Street View), and especially so when they’re interacting with the superflat, Takashi Murakami-esque monsters of the book’s title. There’s also his striking use of colour. 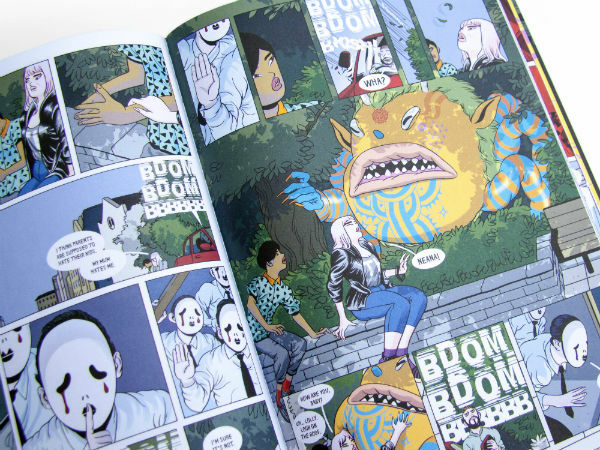 The pick-n-mix palette of the Murakami-monsters is the most obvious example, but there are some more subtle moments which are made by the colouring choices: the way he evokes the low light of a misty morning by a canal, the blinding sun pouring through a suburban living room window in the afternoon, the neon glow of a nightclub dancefloor. There are some fantastic full-page spreads, too. I’m thinking especially of one where a shower of these monsters are witnessed raining down from the window of a skyscraper. The creature designs are distinctive, as are the characters themselves; refreshingly, amongst all the devastatingly stylish young people, Rosh actually manages to look a bit dorky and uncomfortable in his streetwear blog-worthy get ups (the running gag of everyone referring to his bowl cut as a “Lego head” helps). The fleshiness of Mann’s characters is especially appealing when they start punching each other in the face, as in a couple of all-too-brief action scenes influenced either by Street Fighter or Scott Pilgrim, the wrinkles of the profiles becoming more pronounced as they buckle under the weight of clenched fists. The influences Mann’s synthesising for Dalston Monsterzz, besides the stylistic touchstones I’ve already mentioned, couldn’t be clearer. In some places they’re almost literally spelt out, as with Rosh’s drug-dealing scooter-riding pal Kay wearing a red windbreaker riffing on Kaneda’s iconic jacket from Akira, with a hot dog emblem on the back in place of a pill. There’s certainly no small amount of Otomo in the way Mann draws the tower blocks and new developments of Hackney, again making the most of that oversized page. His characters, use of colour, and eye for fashion, meanwhile, put me in mind of the latter-day work of Tank Girl and Gorillaz artist Jamie Hewlett (along with his most obvious student, James Harvey). But besides the inclusion of some recognisable landmarks, there’s little sense of place for a book whose title plants its flag so resolutely in one distinct location. There’s a similar lack of clarity when it comes to the story. Eighty pages doesn’t seem quite enough to properly flesh out the world and the characters, so concepts and themes get introduced and then dropped almost as quickly. 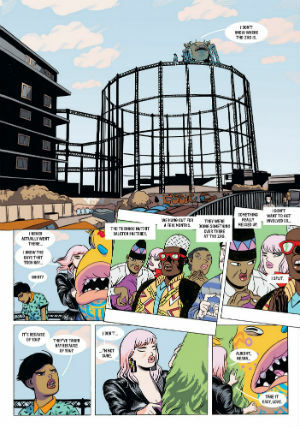 A sequence seemingly inspired by cult seventies film The Warriors, where Rosh and Lolly have to traverse an East London whose various districts are being controlled by different colourfully-themed gangs who ride their monsters into battle like equine steeds lolloping over rooftops, is more-or-less skipped over in two pages. For a book which trucks in cliched plot beats, the use of some Dark Knight Returns-style news reports proves to be a neat way of delivering exposition. Much better than the cringey moment where Lolly literally begins a flashback with “time for some exposition,” a wink at the fourth wall which suggests a lack of confidence in the storytelling rather than a level of confidence that would excuse such a subversive act. There are some gestures towards contemporary themes throughout, such as Rosh’s imprisonment being linked to the 2011 London riots, but they too are never satisfyingly developed. In fact a last-minute allegorical hail mary concerning gentrification falls entirely flat, because its angle is so bafflingly off-the-mark, and it has remarkably little to do with these great huge monsters that have appeared out of nowhere in East London. My first exposure to Mann’s work was the superb self-published mini Queue, which showed the same break-up and subsequent debauched night out viewed from several different perspectives in a manner I am duty-bound to refer to as “Rashomon–like.” Others likely have less favourable associations with his work, considering the criticism he came under for his cover art for issue #15 of Image anthology Island which employed blackface imagery, and for which he (and the book’s editor) was rightly taken to task. While Dalston Monsterzz finds Mann on surer ground and well within his lane, it’s still a notable departure from his previous work. It’s a stylish ride, albeit one that at times feels rushed and underdeveloped. It’ll be interesting to see where he goes next. Tom is a writer based in East London. His work has appeared on Comic Book Resources, WhatCulture, About.com, and a succession of blogs consigned to the dustheap of history even the WayBack Machine doesn’t bother with. Until a bad experience with GCSE Art, he was almost certain he was going to draw comics, meaning he’s the classic frustrated artist critic. Look out! He loves comics that are pretty, funny, gross, smart, and stupid in equal measure.